More and more students are seeking out colleges and universities considered “green” and “Eco-friendly.” Whether these students are looking for a formal education in order to pursue careers in environmentalism, or are just dedicated to living lives of sustainability, there are a number of colleges that have proven themselves just as dedicated to the idea of sustainable living. As a result, campus farms are thriving, buildings are being renovated to LEED standards, trays are disappearing from dining halls, and energy usage and waste are decreasing dramatically. 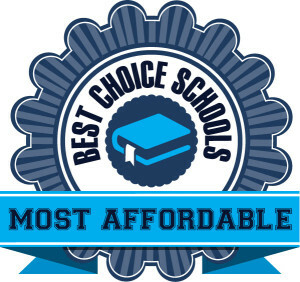 After reviewing more than 300 universities, we believe these fifty to be the very best eco-friendly schools under $25,000 a year. They are ordered based from most expensive to least expensive. Oregon State University may not have constructed any LEED-certified buildings as of yet, but they are fully committed to their eco-friendly reputation. To name just one example: students using any one of the twenty-two elliptical machines in the recreation center are simultaneously generating power for the building. This type of green innovation was rewarded with the Green Power Leadership Award from the EPA and first place in the national RecycleMania competition (OSU cut its waste by a whopping 40 percent!). For those interested in turning their green lifestyle into a career, OSU offers a number of environmentally-focused majors, including the popular Ecological Engineering, and runs the Oregon Climate Change Research Institute. Image SourceNo stranger to generating heat during cold winters, Cal U recently completed a multimillion dollar geothermal project through which 62 miles of deep, underground piping generates heat by tapping into the earth’s constant temperature. This big step dramatically reduced Cal U’s dependence upon fossil fuels, and spurred what has become 37% of the school’s energy consumption being derived from renewable sources. Additionally, all on-campus residence halls are currently in the process of being renovated with green retrofits, and a successful campus-wide awareness program seeks to inform students about what they can do to lead consistently greener lives. Image SourceSan Francisco State has successfully implemented its commitment to eco-friendliness into its curriculum. The University offers both a BA and a BS in environmental studies, and recently incorporated a sustainability literacy course into its core requirements. There is an on-campus vegetable garden, and sustainability-minded student groups lead and manage things like a pledge against bottled water, water refill stations, and zero-waste events. Partly in thanks to its urban environment, upwards of 77% of students and faculty commute via San Francisco’s extensive public transportation system. Image SourceCal State Chico has been applauded by everyone from the National Wildlife Federation to the Sierra Club for its eco-friendliness. 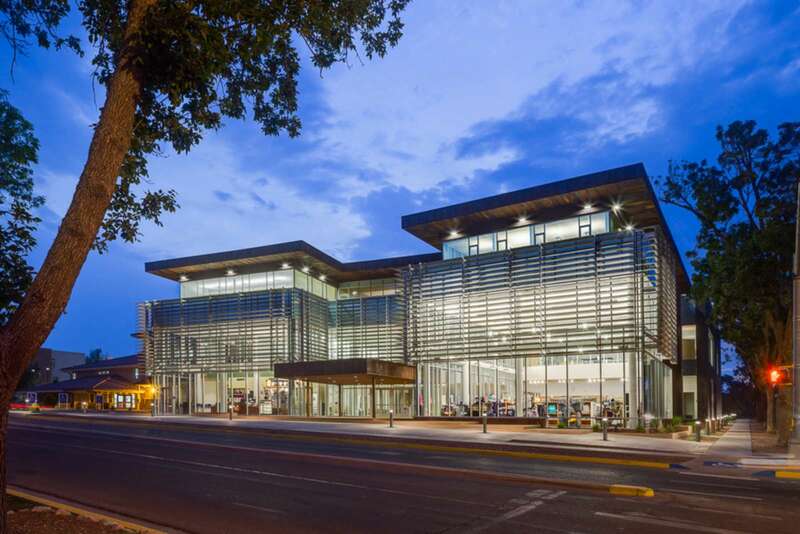 Committed to achieving climate neutrality by 2030, Chico is currently in the process of seeking LEED certification on all of its building projects. Sustainability-minded on-campus organizations include The Alliance to Save Energy, which introduced an energy-saving software to campus computer labs, and Greeks Going Green. There is both a Sustainability House and a student-run farm on campus, and those interested can choose from more than 200 sustainability-related courses. Image SourceArizona State University has taken full advantage of Arizona’s 300+ sunny days per year: through 81 installations on or over campus rooftops, parking structures, and walkways, ASU produces for the campus more than 23 megawatts of photovoltaic power. The school is a leader in the sustainability movement, as is proven by its founding membership status in the Billion Dollar Green Challenge, and 100% of ASU’s new construction meets LEED certification standards. Additionally, oranges, lemons, grapefruit, herbs, and more are harvested from campus landscapes through the program Campus Harvest, and the campus group U-Pass subsidizes unlimited rides for students and faculty on area buses and light rail. Image SourceAt The Ohio State University, eco-friendliness has become part of the campus culture. All new construction must be built to LEED certification standards — step one of the University’s aim to achieve $4.2 million in energy savings. On-campus recycling programs such as All-In-One and Zero Waste Stadium have resulted in impressive waste-diversion rates. The dining services team purchases nearly 30% of its food locally, and nearly 60% of students and staff commute to campus via methods of alternative transportation. Furthermore, for those students interested in environmental careers or research, more than 500 sustainability-themed courses are currently available. Image SourceSeveral years ago, it was the Towson Energy Activists who spurred the entire University of Maryland system into adopting a carbon neutrality policy. Thanks to their initial leadership, Towson is now well on its way to becoming 100% carbon neutral by 2050. Every incoming freshman is encouraged to participate in a “Go Green” orientation to learn about the campus’s many sustainability initiatives. These include the serving of fair-trade coffee in campus cafes, the annual Chesapeake Bay Stream Clean Up, the tray-less dining halls, and the yearly Conservation Contest, in which residence halls compete to achieve the greatest reduction in energy use. Image SourceColorado State University boasts an impressive eleven LEED Gold buildings, plus several more that are pending certification. The University that collected some of the first data on weather forecasting via satellite recently unveiled its new 15-acre solar plant, which is expected to reduce greenhouse gas emissions by 5.5 million pounds each year. Furthermore, the on-campus, student-run Aspen Grille is only the second Green Seal-certified restaurant in the state of Colorado, and serves environmentally-minded cuisine made of local meats, cheeses, and produce. Image SourceThanks to its full on commitment to a green campus life, there is no question that Bowling Green is a leader in university sustainability. Students interested in sustainability or environmental policy as a career are encouraged to participate in an internship program that is offered between Campus Operations and the Department of Environment & Sustainability. Interns are given the opportunity to research waste reduction, alternative energy, recycling, transportation, environmental education, and more. Students can also choose to major or concentrate in Environmental Science or Environmental Policy & Analysis. Image SourceRecently, Georgia Southern University unveiled its new Academic Center for Sustainability through which environmentally-minded students can submit proposals and participate in research opportunities occurring all over campus, including the brand new Renewable Energy Laboratory. Active student organizations include the Green Ambassadors, Geo Club, and Student Alliance for a Green Earth (SAGE). Furthermore, a four-credit environmental science course is required of all students, and those interested in studying the topic further have a wide variety of courses to choose from. Image SourceCal Poly Pomona had a unique challenge to face when it committed itself to becoming a sustainable campus. As a commuter campus, most of its emissions came from student and faculty cars. To reduce its carbon footprint, Cal Poly Pomona improved access to its public transport by organizing carpools, implementing guaranteed rides home, and constructing a dedicated bike lane. It also began a system of priority parking for carpoolers and low-emitting/fuel-efficient vehicles. Additionally, 100% of the water on campus is reclaimed, and the dining services are now tray-less. Image SourceFlorida Atlantic University (FAU) has initiated a unique Mission Green campaign to drive its commitment to sustainability. Mission Green coordinates student-led initiatives such as an on-campus community garden, green tailgating, beach clean-ups, maintaining an on-campus nature preserve, and more. One environmental club, SEEDS, works hard to clear invasive plant species and protect endangered species living on or near the campus. In recent years, FAU has also placed a high priority on green construction: so far, 15% of campus buildings have undergone renovations and achieved either Platinum or Gold LEED certification. University of Louisville is determined to reach its goal of climate neutrality by 2050. All new construction and building renovations are completed using LEED standards, and so far, UofL has been rewarded with three LEED Gold facilities and four Silver. Additional buildings on campus are experimenting with other forms of renewable energy, such as the dual-axis tracking solar array on Sackett Hall. UofL students are also doing their part to encourage others to get involved. Last year, the Cardinals hosted Bluegrass Unplugged, in which colleges from all around the Bluegrass State competed to see who could reduce electricity usage in residence halls the most. Image SourceGrand Valley State University is committed to sustainability in both their actions and education. GVSU currently boasts fifteen LEED-certified buildings, not including the two still under construction. And students on campus have proven themselves just as dedicated by composting almost 50 tons of food waste per month, increasing their annual bus ridership to over 2.8 million student and faculty bus rides, and including local, fair-trade, and organic foods through dining services (which are also tray-less). One popular club on campus, the Sustainable Agriculture Project, runs a Community Supported Agriculture program and provides produce for the campus Farmer’s Market. James Madison University has fully embraced its role as a leader in the green campus movement. Since signing both the ACUPCC and the Talloires Declaration, two groundbreaking documents in college sustainability, JMU has introduced a farmer’s market on campus, transformed its campus transportation system, and greatly expanded its award-winning recycling and composting program. Faculty all across the JMU campus are actively engaged in sustainability-related research, thereby making available to students a number of green internships. JMU also hosts several popular student clubs, including E.A.R.T.H. Club and the Environmental Management Club. Coastal Carolina University’s impressive eco-friendly endeavors are all managed by its Campus and Community Sustainability Initiative. Such endeavors include the Eco-Rep Program, the Student Green Team, and the Students for Environmental Action student club. 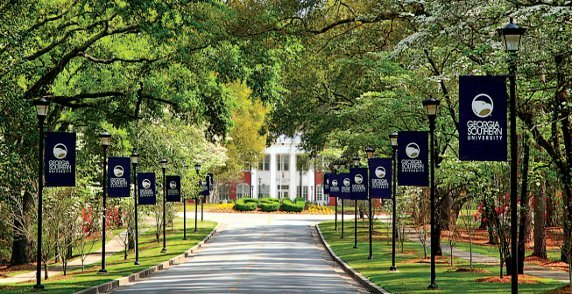 CCU was the first university in South Carolina to offer a fleet of Zip cars, and also offers an organized bike share, a school-developed bicycle plan, a free campus shuttle, and subsidized transit passes. The Sustainability Initiative also works closely with Facilities Planning and Management in order to achieve LEED Silver or better for all new construction and renovations. Image SourceThe state of Maine might not be green for too much of the year, but its university at Farmington has a year-round, strong commitment to staying green and eco-friendly. The University recently installed 80 geothermal wells located underneath the campus quad to be used to heat more than 50,000 square feet of campus facilities. The cost of the geothermal wells ($1.5 million) is expected to be recouped in eight to 10 years and is expected to save upwards of 30,000 gallons of fuel oil each year. Farmington students have also proven themselves just as eager to reduce their carbon footprints. Each year, students in the Sustainable Campus Coalition actively initiate a number of projects to encourage campus sustainability. One popular project, the Recycled Sledding Contest, brings students together to create sleds out of recycled materials. Image SourceFlorida State University has initiated a number of organizations and programs in order to engage its students in environmental activism. A bike sharing program called ReCycle encourages and facilitates the use of bikes, while buses, carpools, and a special taxi service provide free rides around town. Ninety-five percent of campus grounds are maintained organically, 95% of buildings include designated recycling grounds, and students and faculty boast a 45% (and increasing) waste-diversion rate. FSU also offers a variety of courses on environmental issues, social issues, and the economics of sustainability. 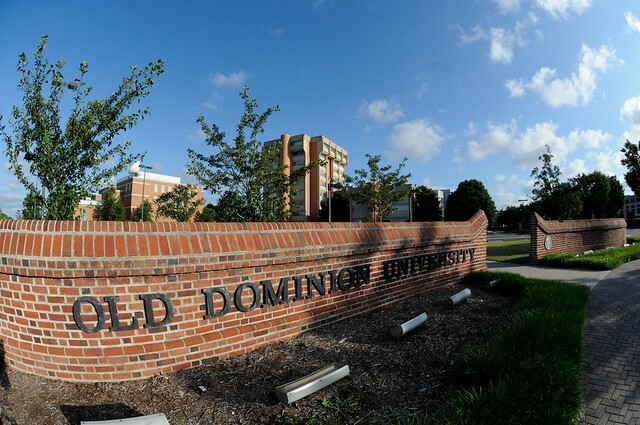 Image SourceOld Dominion University has proven itself eco-friendly in all facets of campus life. All construction and renovation has gone green and now requires — at a minimum — LEED Silver standards. Sustainable research is thriving in a number of departments, including biology, oceanography, chemistry, and engineering, to name but a few. To help the environment and supplement its green-themed courses, ODU recently completed construction on a 3/4-acre wetland restoration adjoining the Elizabeth River. On the dining front, reusable mugs, recycled materials, local produce, green cleaning products, and the riddance of trays are just some of the characteristics of ODU’s eco-friendly Monarch Dining Services. Central Washington University has been an eco-friendly campus since long before LEED standards and ACUPCC initiatives. Environmental Studies has been offered as a program of study for more than thirty years. Still, this hasn’t stopped the advent of modern-day campus organizations such as the Landscape Values Institute, which addresses land-use planning; the Center for Spatial Information, which is currently engaged in research on the environment and economics in the Pacific Northwest; and the Chimpanzee and Human Communication Institute, which is home to three humanely-treated chimps at the center of educational programs for local school groups. Image SourceBall State University implemented an entire Council on the Environment in order to guide its many eco-friendly developments. For example, the University has just completed the first part of a two-phase, multi-year project to replace its coal-fired heat plant and Freon-based chill plant with a ground-source heating and cooling system. Annually, this change is expected to eliminate some 85,000 metric tons of emissions. In addition to hosting multiple conference series on on-campus environmental challenges, Ball State publishes annual Global Reporting Initiative assessments of its sustainability performance, and is consistently ranked among the top U.S. universities. Image SourceLouisiana State University’s Campus Committee for Sustainability is leading the charge when it comes to issues of sustainability. A number of programs have been introduced to reduce the number of vehicles on campus, including a Bus Service Study, restricted parking, a guaranteed ride home program, and bicycle share/rental program. Over 70% of campus is maintained organically, and 45% of campus food is local, organic, or otherwise environmentally-responsible. Environmentally-focused student organizations are prevalent on campus. One such club, the Environmental Conservation Organization, is a grassroots group that works to improve both the quality of life and environmental health of the Baton Rouge community. Image SourceSince initiating its recycling program more than twenty years ago, Salisbury University has recycled more than 6 million pounds of material. Today, its waste-diversion rate hovers above an impressive 50%. Additionally, all residence halls are equipped with Energy Star washers and dryers, and every single building on campus has received energy-saving retrofits. Salisbury students are also environmentally minded, and have made student organizations such as the Environmental Students Association, Smart Growth Club, Green Floor Living, and Garden Club some of the most popular on campus. Image SourceSUNY Albany has taken on a number of initiatives through which they’ve increased the eco-friendliness of the campus. Albany participates annually in RecycleMania and, as a result, disposes about 1,800 tons less each year. Other initiatives include the Change A Light campaign, the Empire Commons electric bill program, and the installation of solar panels on the Social Sciences building. All new construction is designed to achieve LEED Silver or better. For those students interested in seeking a formal environmental education, Albany offers a number of sustainability-themed courses, as well as a major in Environmental Sciences. Image SourceIn order to achieve its goal of carbon neutrality by 2050, Southern Oregon University has founded the Green Fund in order to provide funding to students willing to take on sustainability projects on campus. Successful projects have included the creation of a sustainability center, solar installations, and the offset of 100% of campus water use. A 56-kilowatt solar photovoltaic array, which produces more than 70,000 kilowatt hours per year of useful energy, was installed on campus — an impressive feat that was rewarded with a LEED Platinum certification (the first in the entire Oregon University system). Image SourceThe Evergreen State University has the ambitious goal of complete carbon neutrality by 2020. To achieve this, the College has initiated things like campus-wide composting and recycling, sustainability courses within the core curriculum, and annual carbon inventories. Each student and member of faculty receive free bus passes, and are encouraged to be mindful of vehicular pollution. Quite impressively, a whopping 35% of the campus’s energy consumption is derived from various renewable sources (including a 9-kilowatt solar panel system), and 33% of food purchased for the dining hall and campus cafes comes are local and/or organic. Image SourceThanks to a sincere combination of institutional commitment and student enthusiasm, SUNY Oswego is a thriving University of sustainability. All new construction is required to meet LEED Silver standards, and every residence hall is outfitted with specially-designed shower heads, low-flow toilets, and green cleaning products. There are a number of student-led organizations on campus, such as the Students for Global Change and the Go Green Team. Those interested can choose to take courses such as Environmental Chemistry, Environmental Economics, and Sustainability and Human Behavior. Students are also encouraged to submit proposals for sustainability-related research through Oswego’s own Rice Creek Field Station. Image SourceUniversity of Arkansas boasts three separate sustainability centers, all of which provide other institutions around the world with environmentally-focused educational, research, and outreach programs. Additionally, all new on-campus construction is required to be built to LEED Silver standards and so far, UA is able to boast two LEED Silvers, two LEED Golds, and one Green Globe. UA’s dedication to sustainability has really paid off: by 2013, it had reduced greenhouse gas emissions to below 2002 levels, despite doubling student enrollment and adding more than 1.6 million square feet of space. Image SourceWhether its energy, construction, food, waste, or academics, Western Michigan University has made sustainability and environmental friendliness a priority in every aspect of campus life. Too name just a few of CMU’s impressive accomplishments: every campus meal is also offered as a vegetarian option, the campus boasts a 25% waste-diversion rate, 100% of renewable energy is produced onsite, and 35% of the campus’s total energy supply is produced from renewable resources. For those students majoring or concentrating in Environmental Studies or a related field, CMU also hosts an annual green jobs seminar to guide students toward careers in sustainability. Image SourceMorgan State University is home to The Center for the Built Environment and Infrastructure Studies, a 126,000-square foot building. The $54 million dollar building boasts several green roof systems and photovoltaic panels that provide Morgan State with usable energy. In addition to its LEED Gold certification, the Center has won a number of awards that include the Maryland Public Building of the Year, the North Carolina Merit Award, and the Baltimore Design Award for Sustainable Design. Image SourcePerhaps due to its massive 5,500-acre campus, Texas A&M has gone to great lengths to reduce the number of vehicles on campus. Those who wish to can borrow a bicycle for free through the “Borrow a Bike” program. Otherwise, all students and members of faculty have access to the free shuttle services around campus and around the local community. The University’s sustainable endeavors have seemingly worked. Since 2002, Texas A&M has been able to decrease its energy consumption nearly two trillion BTUs while simultaneously expanding the campus. Image SourceUniversity of South Florida is dedicated to implementing a number of eco-friendly initiatives in a variety of areas. All new construction is built to LEED Silver standards, and so far, the campus boasts five LEED certified buildings (two of which are LEED Gold). Academically, USF has incorporated sustainability into its core curriculum, and also organizes an annual Green Job Fair and events for Earth Day and Arbor Day. A whopping 18 environmental student groups are active on campus, including Emerging Green Builders, Engineers for a Sustainable World, and the Student Environmental Association. Image SourceUniversity of Idaho has a number of long-term plans for achieving carbon neutrality. 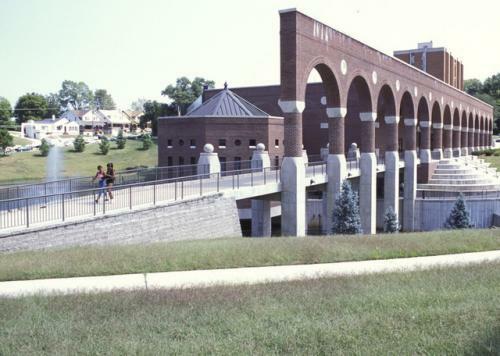 So far, the University has converted an on-campus steam plant to a biomass boiler, returned a total of 84 acres to native vegetation, installed a green roof on the Student Union building, and set aside more than $35 million for various energy conservation projects. To encourage the student body to get involved, a program was initiated that exchanges a free meal for an hour spent educating fellow diners about composting and recycling. Additionally, all new construction must be built to LEED Silver standards. Image SourceSince implementing an annual Climate Action Plan, Framingham State University has several notable achievements: Framingham converted its power plant supply from oil to natural gas, increased its renewable power supply, constructed a new recycling system and compostable dining area, and restructured its class schedules to decrease the number of commuting days. 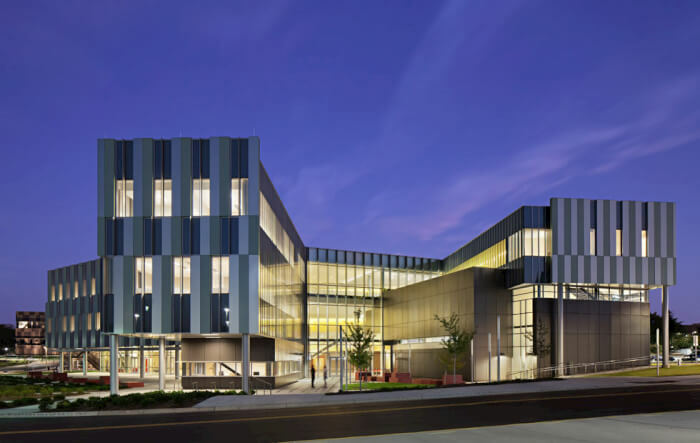 Perhaps most impressively, 75% of Framingham’s campus buildings have undergone energy-efficient renovations, 15% of which are already LEED certified. Additionally, popular student-run organizations include the Green Team and an Environmental Science Club. Georgia Tech is home to the largest university residence hall in the world with LEED Gold status, a renovated Olympic Village that is now home to more than 2,000 students. Georgia Tech tops yet another list with its 1.4 million-gallon campus cistern, which collects rain and condensation water for flushing and irrigation, and is the largest of any system on any U.S. campus. The cistern itself is part of the new Undergraduate Commons, a sustainability showcase building which boasts green labs, a garden roof, solar pv, dashboard, and much more. Indiana State University has already reduced its current carbon emissions to nearly half of 1990 levels. This success has come on the back of a number of new initiatives implemented after a campus-wide survey revealed that 80% of the school’s entire population believed that environmental sustainability was a cause for concern. Some of ISU’s most impressive initiations include a number of projects at its campus community garden, the installation of a wind turbine, an educational greenhouse, and a popular Environmental Science Club. Image Source$19,519/year: An ACUPCC signatory, North Carolina State University has already completed its Climate Action Plan. 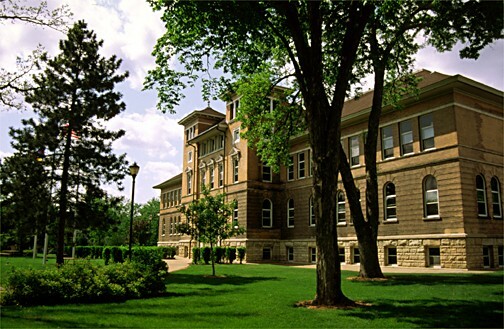 The campus is home to one of the oldest academic departments of Forestry and Environmental Resources in the world, through which it continues to offer students a wide range of environmental concentrations and majors. More recently, NC State partnered with the State Department of Agriculture to establish a working campus farm facility. The many student-run campus organizations with a commitment to sustainability efforts include the Student Government Sustainability Commission, Wolfpack Environmental Student Association, and Net Impact. The only university in Michigan with a student sustainability fee, Western Michigan University is making great strides in its effort to build an Eco-friendly and sustainability-minded campus. All new construction and renovation must achieve LEED Silver or better, and so far, both LEED-certified buildings have managed to do so. To encourage the purchase and use of electric vehicles, WMU has installed more than twenty free charging stations around campus. Other major initiatives include a heat recovery system that uses heat from the Ice Arena chillers for the Olympic-sized swimming pool, occupancy-based light sensors, Energy Star appliances, tray-less dining, low-flow showers and faucets, chemical-free water treatment, and much more. Iowa State University has proven itself willing to go above and beyond when it comes to campus sustainability. Ambitiously, it requires all new construction and major renovation projects to achieve LEED Gold certification. So far, it has succeeded, with two of its buildings achieving the even higher status of Platinum. The implementation of tray-less dining services reduced food waste by more than 50%, and the food that is wasted is composted at the University’s very own compost facility. Active student groups include a Solar Decathlon team, The GreenHouse Group, and Keep Iowa State Beautiful. Image SourceCal State Monterey Bay is well on its way to achieving its goal of carbon neutrality by 2030. In recent years, CSUMB has installed more than six acres of photovoltaic panels designed to deliver zero-emission renewable energy to campus. Thanks to campus initiatives such as an increased number of recycle bins, the recycling of cooking oil, and a number of energy-saving retrofits, CSUMB has achieved an impressive 42% waste-diversion rate. Even at graduation, walking students wear gowns sewn with material made entirely from recycled plastic bottles. Image SourceAs a campus of mostly commuters, New Mexico State University has recognized the unique challenges it faces when it comes to organizing an Eco-friendly campus. Still, the University has taken a wide-ranging approach and has so far proven quite successful. Since establishing itself as a Bicycle Friendly University, campus fleet fuel consumption decreased by 54%. Students also have access to a free shuttle service that can take them to and from the City of Las Cruces. There are a number of dedicated student organizations on campus, including Environmental Science Student Organization, Aggie Students Inspiring Sustainability, and Take Back the Tap NMSU. It makes sense that a school as aesthetically pleasing and recreationally rich as Appalachian State University would be so dedication to sustainable campus life. The University has seventeen renewable energy installations on campus, including North Carolina’s largest installed wind turbine. Transportation alternatives such as free or subsidized mass transit, car sharing, and ride sharing are all encouraged of both students and faculty. A new 396-acre teaching and research farm allows students the opportunity to enhance classroom lessons and learn about agroforestry and sustainable farming practices. Last year, Appalachian was chosen as one of only three universities to compete in Solar Decathlon Europe. At Portland State University, students play a crucial role in creating an Eco-friendly campus environment. Freshman are given the option of living in a Sustainability Living Learning Community, while any student who uses the recreation center (a LEED Gold building) can generation energy by using exercise equipment. With everything from eco-roofs to district-scale energy systems, the PSU campus is a living lab dedicated to teaching every student — regardless of major — the importance of sustainable living. Image SourceFrostburg State University has a number of academic opportunities for those students interested in pursuing a formal environmental education. More than fifteen departments offer courses or degrees in environmentalism, while Frostburg recently opened its brand new Sustainable Energy Research Facility, which will be home to a variety of research projects. A day each year is set aside as a day of learning on environmental sustainability and climate awareness, though students wishing for more than a single day can sign up for various student-led campus audits. Also notable is Frostburg’s current project in which it is converting a reclaimed strip mine into a greenhouse. Image SourceUniversity of Alaska is a true leader when it comes to implementing sustainability initiatives. The ban on trays in dining halls has resulted in 50% less food waste and 222,000 fewer trays washed annually. In addition to extensive composting efforts, Fairbanks students have also organized a program to recycle items such as cell phones, aluminum, batteries, and printer cartridges. Finally, Fairbanks is encouraging green transportation by offering bicycle locker rentals and a free shuttle service. Image SourceRecently, University of Wisconsin Stevens Point opened its new Operations and Waste Management Facility, the first of its kind amongst Wisconsin universities. The facility features a pilot wastewater treatment plant, a composting lab, a microbiology lab, and a recycling center — all things contributing to Stevens Point’s ambitious goal of carbon neutrality. Additionally, Stevens Point newest residence hall recently received LEED Gold for its ability to derive an impressive 35% of its electricity from renewable sources. Image SourceNot only does New Mexico Highlands University’s Student Centre offer students a much-needed space for relaxing, studying, and socializing, it consists of a groundbreaking Eco-friendly design that has been rewarded with a number of awards and mentions. The LEED Gold certified building is both innovative and energy efficient. A motorized sun tracking louver system on the south side of the building simultaneously shades the building while maximizing the use of daylight. The Student Centre is said to be the first of its kind in North America, though judging by the attention it has received, likely not the last. Image SourceUniversity of Northern Iowa’s on-campus organization c.a.r.e. (creating a responsible environment) promotes Eco-friendliness and sustainable living through a number of on-campus initiatives. In dining services, most disposable items were eliminated and a refillable mug program introduced. A local buying program was also introduced and has successfully reduced packaging and shipping wastes while simultaneously supporting local vendors. The University itself has done its part, too. Currently, a whopping 23 campus buildings are undergoing energy-saving retrofits or renovations. Image SourceIn addition to undergraduate degree programs in Environmental Science and Agriculture, and a Master’s in Environmental Science, Lincoln University offers students interested in environmentalism a number of opportunities to further both their education and future careers. An impressive 26 faculty members are actively involved in sustainability research, and students are also given the opportunity to submit specialized project proposals for funding by the University. Additionally, Lincoln is home to a chapter of the national society of Minorities in Agriculture, Natural Resources, and Related Sciences (MANRRS), which promotes diversity in agricultural and other science fields. Berea College has proven itself a model of green higher education. Not only did it have the first LEED-certified building in Kentucky, that building successfully achieved LEED Platinum. Berea’s Ecovillage residential complex provides fifty sustainable residential accommodations for student families, all of which include individual garden plots, low-flush toilets, and a community aquaphonics system where student residents raise tilapia, catfish, herbs, and vegetables. The College Farm and Garden produces much of the food offered on campus, though the College also works with a number of local farmers. Berea also boasts a almost 9,000 acres of forest, streams, and ponds, where students are given hands-on lessons about the natural world. Net price was gathered from College Navigator. In-state net price was used, if available.